I take us back to the eighties. At that time, with no previous data, some scientists declared that polar ozone holes were growing and would kill us all. The carbon people noted their success. 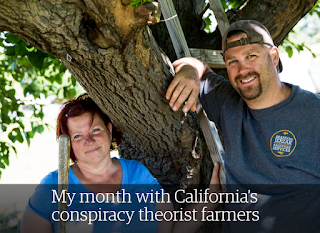 These people went nuts, noting that the existing CFC could release chlorine, and kill ozone. They came up with a reaction, and just assumed an actual rate. This was a great 'just so' story. In 2007, somebody decided to do some actual atmospheric physics. Never done for carbon. Anyway, they discovered that the actual reaction rate for that magic chlorine reaction, was a factor of 10 lower than what had been assumed. It was probably good to kill the original freon, since it didn't break down easily, somewhat like DDT. Which gets me back to my story. 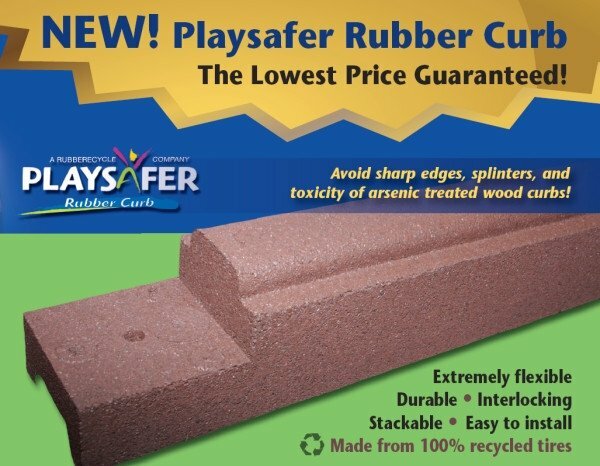 R410A uses flourine, not chlorine, and nobody has made up a story about that. So, it was declared 'safe', without physics. However, the infra-red thing is much higher than carbon, so it is declared a horrible greenhouse gas. Lucky for us, it was declared 'good', since it is much more efficient. Back to the new air thing. It works at a much higher pressure than the old one, and can have those little finny things 10 times thinner and closer. This is wonderful, until you want to start the thing in the spring. Those stupid fins are clogged with spider webs! I tried a powerwash with oxy-clean but it did nothing. You have to get it serviced every year and they soak with with their 'super magic' chemical that I think is pinksolution enzyme cleaner. The junk just dissolves, and you can just rinse it with a hose. Personally, I'll stick with the guy coming every year for under 200. It also needed a cup of gas, but that was not charged. If I were cheap, I'd look at getting pinkstuff or something else. I'm pretty sure that detergent alone can't handle it. **stupid ozone holes are caused by atmospheric conditions, and goes up and down (like temperature) like a toilet seat. ***the holes happen because the extreme cold stops the standard ozone reaction. Someone should tell them that there are no chemical reactions at extreme cold, especially the fictional freon reaction. Oh well, that's all sewage under the bridge. Nobody cares. Surely we can't make that mistake again! 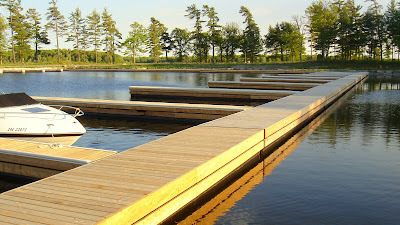 Our marina has put in docks like this, with a main runner, and spurs for boat access. Trouble is that these spurs are connected with hinges, so that they can take the big waves. These hinges have a give which translates into a wobble at the end of about 2 cm either way. There is no damping, so the velocity is about 10 cm/s. So a displacement of 2 cm with 10 cm/s is a good earthquake. People are going nuts! This ground motion, just like an earthquake, makes people think they are going to dump into the lake. But you really need a displacement of 20 cm to lose your balance, and probably 50 cm/s. That's a damaging earthquake! Nevertheless, these dock earthquakes are a bad feeling. You need to dampen the torsion of the spurs. Basically, I am thinking about rubber at the inside corners. I was looking at an inside corner docking bumper, but they don't have those. Probably just heavy dock bumper strips bent at a 50 cm radius on the inside corner will do. ps. I really like recycled rubber crumble stuff. The damping coefficient must be huge. I get some of these things to try out and review. This is an air fryer, about 2-300 bucks. Here's my video. Fantastic fries. Now I'm doing sweet potato, which we love. We're talking majorly healthy here. We just came back from the buggy cottage and went to our favourite chip wagon. Beautiful fries, soggy with fat or the cheap palm oil they use. You won't live to your nineties with that! These fries are better. ps. just tried sweet potatoes -- great! And we had cut up roasted veggies for dinner. -- zucch, peppers and onions. great! Friday - came up late, traffic not too bad, took the 407. Raining at the boat, and mosies were terrible. Stupid boat had to the bilge pump stuck on full, and battery was dead. Good thing I could use my little lithium battery booster. Worked great. Got to the cottage, busted olive oil bottle, yuck. Couldn't fix the pump. Will have to use the pack to start it again. Saturday - had a fire overnight. Neighbour picked me up to go fishing for lake trout. Hundreds seen on the sonar, not one nibble. Bugs are horrible, waiting for the dragonflies. Bring on the air force! 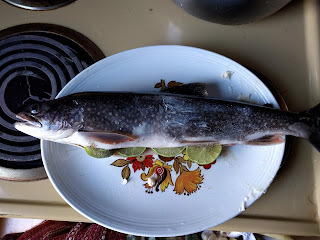 Lake trout brought in by my neighbour. They got it while paddling. Sunday - hot, unbelievable bugs. Full nets on, and now it's getting too hot for them. Arrgghh. Pure hell. Coming home - dragonflies are out. Yeah! When you are a crook you can't find good help. So, all the absentee, money-laundering, sealed condo people aren't around to check if the condo corp is legit. So these types of people move in for all the condos. The coming crash will shake this out, perhaps. I've just loaded rc2. I always try the latest versions, but I always wait until rc2. I've noticed the fastest boot time yet to first keystroke. Almost Chromebook level. Try that with the latest win and latest laptop. OMG! It's painful. I'm about to prep up the cottage laptop, and I'll see how this works. I saw this happening in the middle of November, when the bottom fell out of the extremely frothy Unionville market. Then we went through our 6 months of a listing strike. Now we come to the fact that most people can't hold out any more. Walk away from your deposits, people. Don't be caught holding lots of houses. 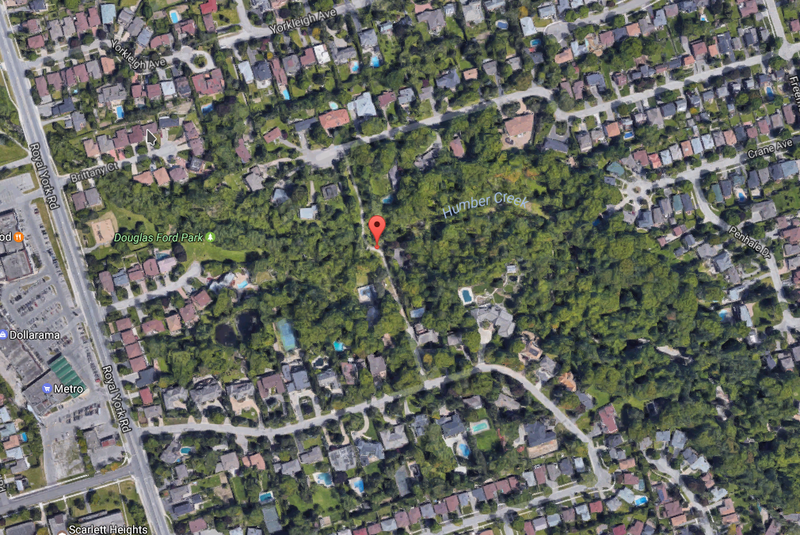 Everybody and their dog in Toronto has two houses, one they are holding on to, and the other being built and just coming on-stream. All those giant condo buildings going up in the middle of nowhere have deposits. For 10 years or more, it was the key to riches. Everybody in those outer tract lands played the game of buying early in a new subdivision and then selling the old one for a big profit. Now these people must dump. The prices will be determined by the most desperate. A divorce? Death, whatever. All the banks have designed this boom expecting a 20% drop. Ha! These things are never what you expect. We have binomial theorem working here, and it isn't kind. A totally lawless area is unstable. There is no limit to depravity, and the most violent people get the power. Soon everybody is killing each other, and they starve. The same thing has happened with science. 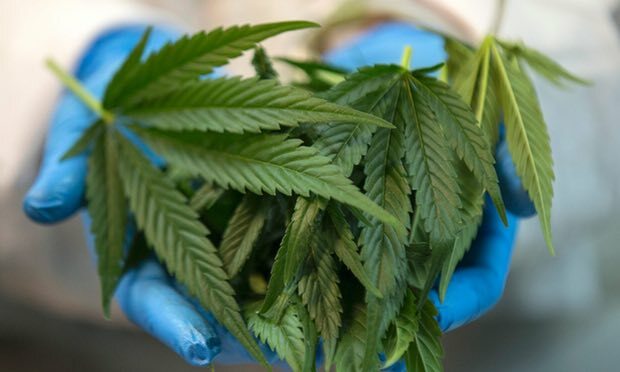 The law used to be the 'Scientific Method', and all scientific discussions were carried out under that law. The law evolved during the great flowering of the Reformation, or Renaissance. Before that, we just had the scientific 'law' of the Ancient Greeks, which was no law at all. They just made up 'just so' stories and shouted everybody down defending it. It gave us the Dark Ages. Right now we can blame Facebook for everything. :) The old Internet forums usually had a couple of cranky people who could slam down anybody for breaking the law of the Scientific Method (SM). 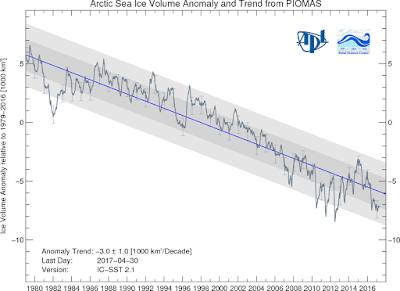 Now, all the scientists are confined behind their PR department walls and cannot enter any discussion without approval. But even if scientists make official pronouncements to official news sources, we can no longer believe them. They are all driven by 'other considerations' such as government funding, or student attendance. With Facebook, SM broke down when the Aristotolians seized control of global warming. If anybody raised objections about the physics they would engage in a massive social media campaign to get those people fired. And every scientist works for a place that is sensitive to public pressure. ps. it started with the Bible Belt, and that is no longer an important part of Willful Ignorance. FB Science is now the dominant trend. Everybody wants to give up thinking. With companies, it makes you immune from the Law, and you can survive as long as you have a monopoly. However, this always ends in tears. 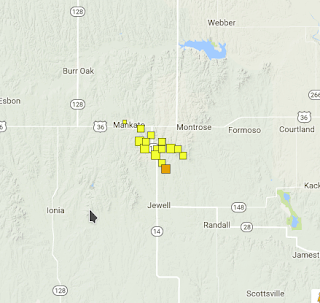 I am very impressed with the Kansas earthquakes. They are progressing rapidly, with the latest recorded as an m5 in many places. I expect an M6 next week. You can see there is massive freshwater injection at the NW tip and the earthquakes are running down the cross-fault to the megathrusts. As with Azle, Texas, the earthquakes will go down the line and get bigger and bigger. The location is only the epicentre, which is the initial point of the rupture. However, you can be sure that the ruptures run back to the source. This can only be measured with strong-motion accelerometers. In Texas, they engaged their great conspiracy and quietly dropped the freshwater injection. They couldn't tell anybody because that would trigger lawsuits. It is best to handle all this verbally, and then 'forget' everything. The 'Stupidity Defence' works every time! I am amazed at how far this is going. I suppose that nobody lives there and the directivity is going back to the upper state, where nobody lives, as well. The next m6 might change opinions. On a day that will live in infamy, the greedy landowners have seized a popular ravine walking trail. This is an incitement to violence that never exists in Canada. We believe in peace, order and good government. This is our fine park. And this is what they have done with it. Note that people are starting to get violent with the sign. Thousands of people are blocked. That is, if they don't know that in Canada these signs are worthless. 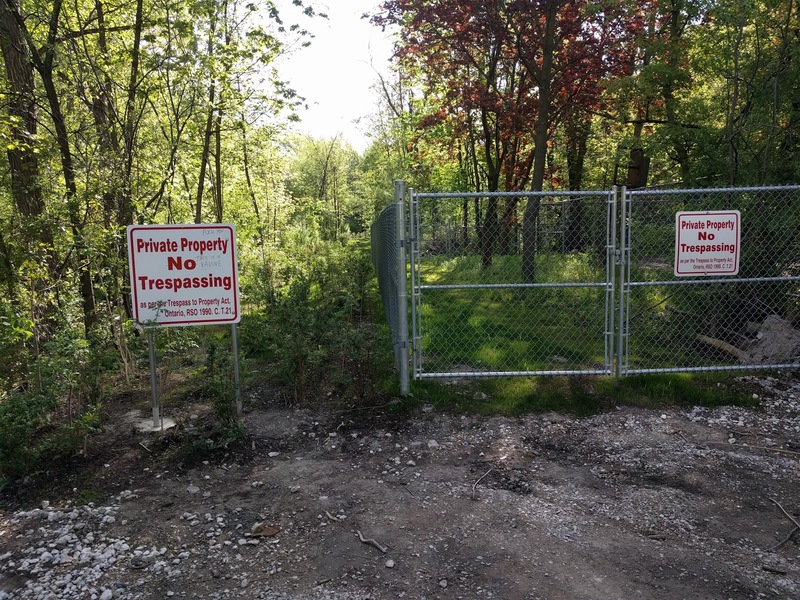 Trespassing cannot be enforced, except in civil court and that never works. Sure, people lurking around your house are in trouble with the police, but the police aren't coming for this. Old Rob would never have stood for this. He would have ranted and raved at the sign, and then tumbled into the creek for posterity. Here is the location. 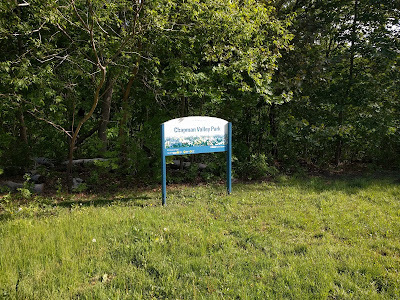 So, for the upcoming Annual Rob Ford Day, I invite everybody to come and lay flowers at the sign, in memory of a great walking trail. Park on the streets, the landowners will love it. Add some original art to the sign if you want. Free Beer! Loud Music! 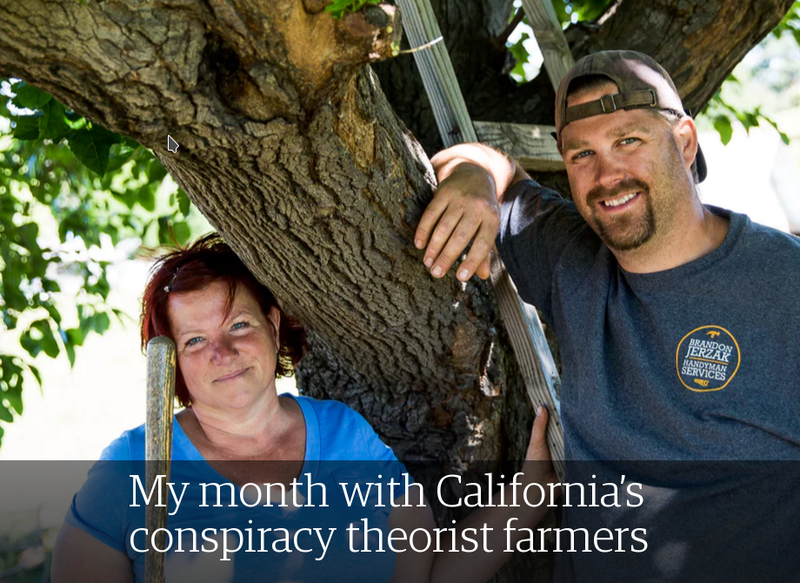 Workers have a rough time in California, and the new economy has not been kind to them. Callie is an 'at will' state, with no maternity benefits, so companies can do anything they want. The rich cities such as Palo Alto do things to keep workers out. I know a person doing the major Google construction and they are severely limited in how much they can build because they can't get workers. There's no place to live! In the rich city it's all small cottages, and no new high density is allowed. Over the road in East Palo Alto they haul out the bodies every morning. This is where the 'Palo Alto Method' gets into trouble. Musk can design till the cows come home, but he wants to get into the 'mucky' stuff. New ransomware goes up the Microsoft chain - Fake News! My adopted 'old man' just had his computer hosed. He didn't click on anything recently. No backups. I've always wanted him to get a Chromebook. Anyway, it was win10 with automatic updates. The most common system in the world. I'm off to restore it, but it was supposedly fully protected, and I'm sure it will get it again. ps. cbc just asked my what ransomware it was. I'm going over there this afternoon, and I'll take a picture of the screen. pps. CANCEL EVERYTHING! This was just an ms-money thing. ms changed something and it couldn't find the main file. It spewed out obscure pages that looked like ransomware. It litters his desktop with countless phoney backup icons. It took me a long time to find where they hid his file. ppps. and I just found that ms-money is done and gone. 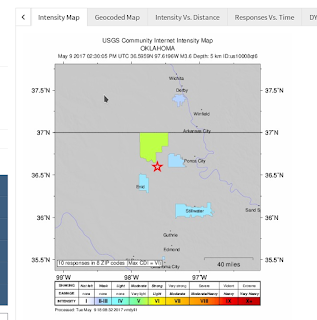 The great thing about the Oklahoma seismic zone is its ability to get everything else excited. 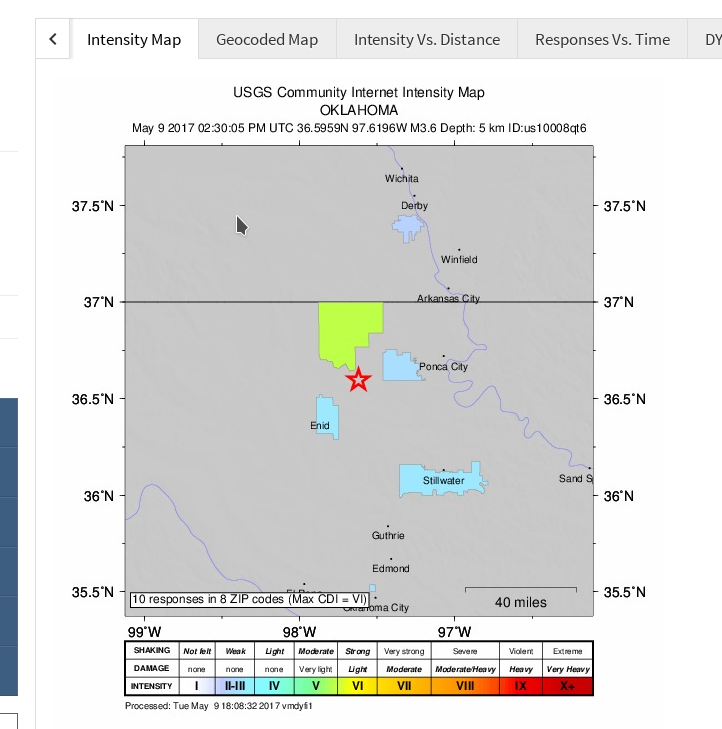 This is an M4+ earthquake, with an intensity of 5. 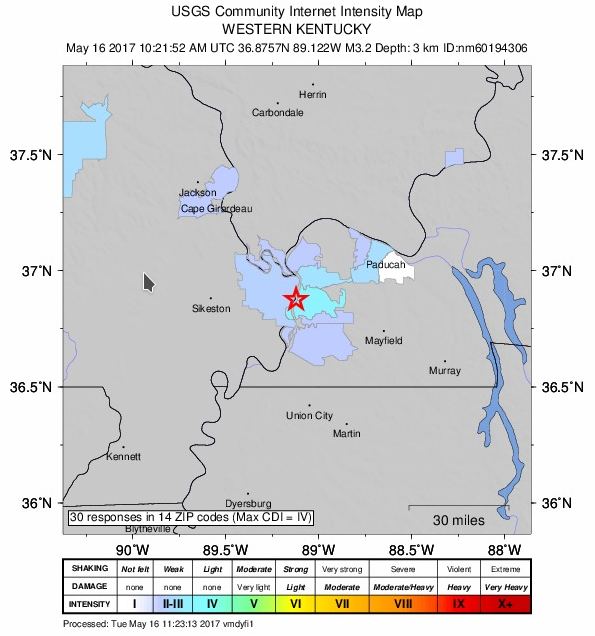 Right now, it's officially an m3.2 but it was recorded as a 4 in many places. 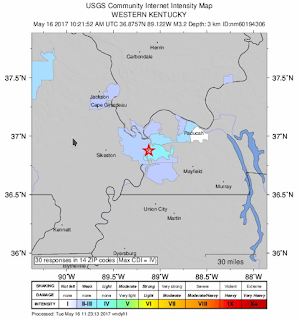 That means it had a strong directivity and it shows the classical felt area of a thrust fault. I've always said the existing NMFZ was dead in the old place. It has to extend or shift to become a threat again, and Oklahoma is kicking it. It can go up the river, which is controlled by the megathrust fractured zone. ps. followed by a deep m4 in OK. The whole thing is now at my expected level, post trumpy. I'm expecting a higher seismic energy rate next month. ... and another m4 bites the dust. Toronto missed the great rain, but cottage country got the full blast of maybe 5 inches. Everything is full up. We had sun on Sunday, and put everything out to air. You can see the lake is a foot above anything I've ever seen. Boat houses at the marina got smashed because the water was going up and down like a toilet, to stop downstream flooding. The blackflies are just starting. They really came out in force on Sunday, when it got too warm to work and wear nets. This was our summer opening since we'll be busy the long weekend. The big news was the flooding along the highway. We got out at Burleigh Falls on the way back and took these videos. That's the highway bridge. And the dam is flooded. ps. Wednesday is supposed to be sunny and 30. 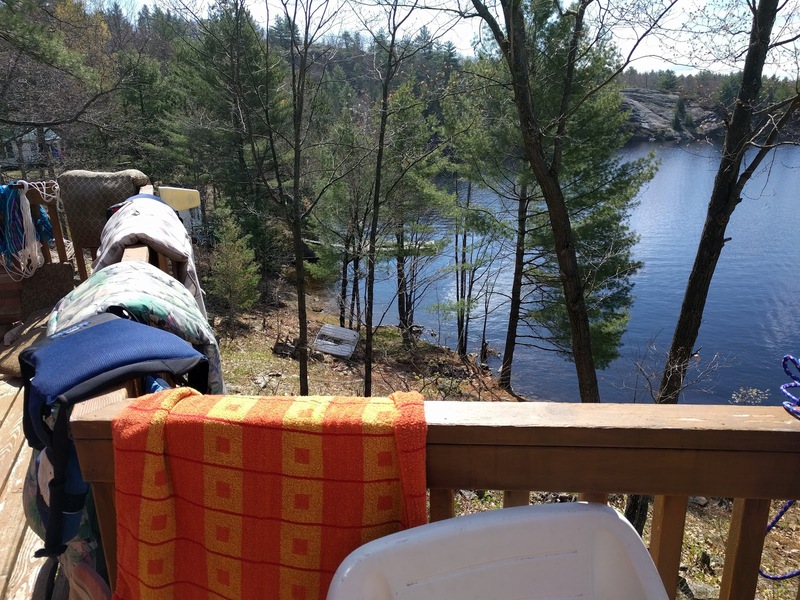 You don't want to be at the cottage with full blackflies and the water cold as ice. Pure hell. 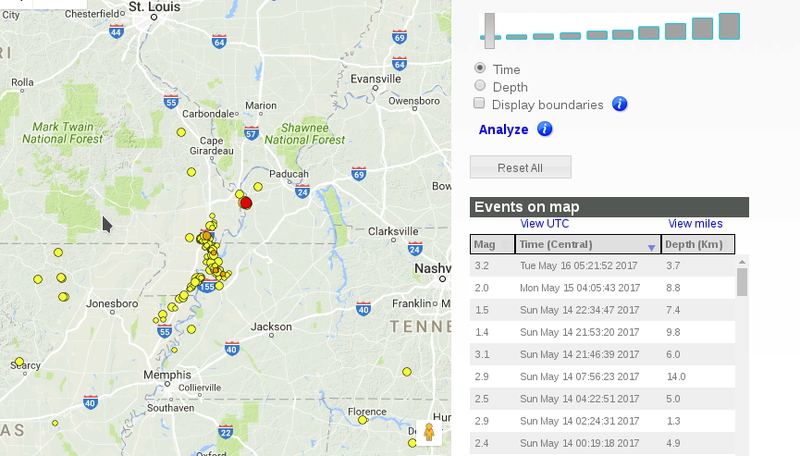 Ever since the Easter injection break, all the earthquakes in OK just stopped. I was really worried that they listened to me and started treating the water. But today I knew they didn't. Look who they elected president! This is a shallow thrust with an intensity of 6. May have knocked something down. The surrounding seismometers went as high as 4.5 so I'm calling one of my weekly 5's. It's officially an m4, rounded to single digits. We should be getting back to one of these a week, and a 6 every couple of months. That was the rate before Easter, and I'm expecting it to continue. Heat it in olive oil, just below the smoke temperature. Get a candy thermometer. I should have got one for the last batch. It's horrible if you overheat. Keep it at that temperature for 45 minutes. Then store it in the fridge, goes semi-solid. Take a daily dose, just below feeling anything. You may have to experiment on that. This is now available for any old person in Canada. Prevents alzies. Go for it! ps. you have to do this yourself, since edibles won't be available for 2 years. pps. I'm getting my adopted old guy to get a prescription from a geriatric specialist. We'll see if that works, and then we'll do oil. I find that a small daily dose gives a wonderful clarity of mind. Normally, I am so distracted, it's great to be right in the 'zone' of the moment. I had two down by the river. The sewer project is now pushing pipe 6 months late. But this erosion project has many of my videos. The upper slopes are finally failing and Toronto missed the heaviest rain. The whole thing is going to go if we actually have a real 4 incher rain. I'm a Vine reviewer for Amazon. That means I get small stuff for free and then I write a review. However, I was in the Top 500 and now I've been bumped down to Top 1000. Soon I'll drop off the cliff! So much pressure! I'm now going into video reviews with my dog, and this is my first one. I must get back on top! This is really good physics, something I don't expect from 'official' earthquake people. The video shows ground velocity which has a direct connection with damage. You can see the directivity of the giant thrust fault, and although it progresses up the line, it is not a strike-slip fault. A video like this is another nail in the coffin for ground acceleration. But not this day. :) Engineers make good money going with acceleration, and the geologists make good money going with strike-slip faults and the hoary old 'elastic rebound theory'. The new method of science is to seize an issue and then fight off any comers, like a game of 'King of the Castle'. I had a lot of fun with that as a kid, especially on giant snow piles. 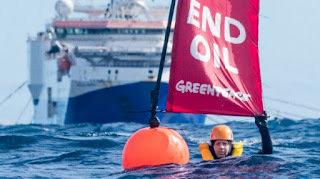 The concept that seismic surveys do damage to marine animals is demolished if you look at it with the Scientific Method. However, it is a great issue for 'Aristotle Science'. As with gorming, you merely plant your flag in the public's eye, and state "Prove that it doesn't!". It also works with alien kidnapping. Oil companies would be better off if they went pro-active, and released all these records in a slightly smudged version, good enough for tectonic studies. They really need to do this in Oklahoma. However, as long as they appear 'sinister', the greenies will go after them. He went through Queen's Commerce with my nephew, so I feel I can comment. All of his successes have come from the 'Palo Alto' technique. That means, realize that some people are 10 times more productive than the bunch and pay them accordingly. No company east of there does that. Now, for design and software, that works really well. But other things come against basic physics. Mr. Musk must realize a productivity improvement by a factor of 10 if he doesn't want to be 'bored' with the whole thing. He can't get that with actually digging the tunnels. It costs so much to excavate a cubic meter of soil and that's that. In past 30 years, giant digging machines have improved things maybe a factor of two, but they always get stuck. We are now flatlining the economics. Yeah, as a Canadian I love Arctic ice. Give me more and more! In fact, why not extend it all the way to my cottage? /\ (mountain of sarcasm). During an El Nino, an enormous amount of heat energy goes into the Arctic, and blasts out into space. That's my nice summer, we're talking about here! 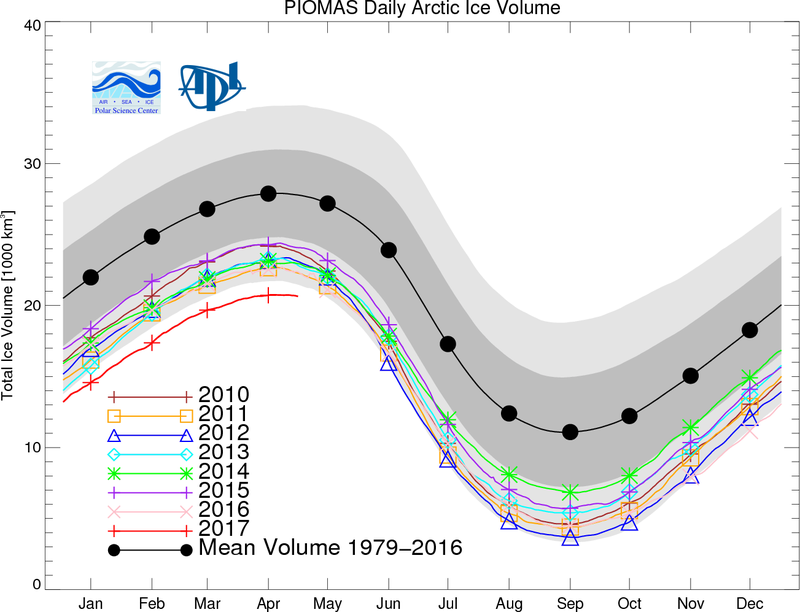 It's not surprising that ice volume takes a hit (too bad!). So, in May, the very bottom curve shoots straight into the bulk of the graph, when it should be shooting down like all the other years. Yech! 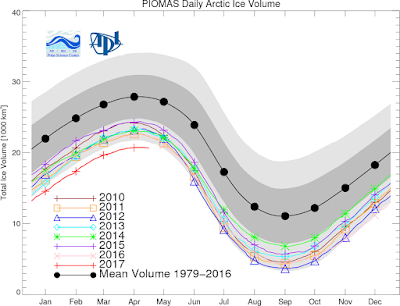 Look what the stinkin' El Nino did to the ice volume. Last year, the lowest winter rise ever, following a huge drop. This confirms we had the biggest elni ever. None of the warmists want to mention that. If my summer is miserable, then we'll see the biggest rise ever, as we grapple with the loss of heat energy. You and I can huddle in the barrel sauna all summer, and watch the Arctic ice volume. When the kids were little I was forced to go on a lot of rollercoasters. blah. There's always the part where they go up, and the rails go tickety, tickety. It's being on the top that starts the whip snapping. 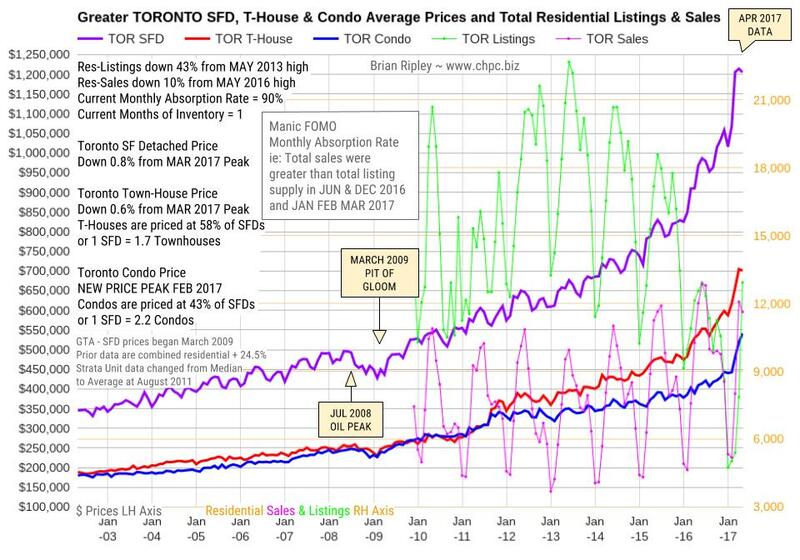 So the Toronto Housing market has done its clickety, clickety, and is going over the top. 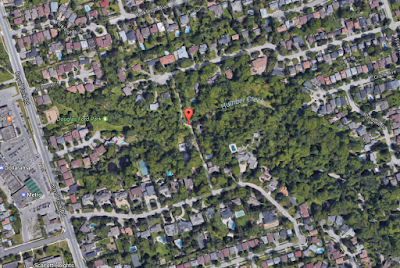 Note that listings are zooming, and I can see this with signs around the woods. I was soooooooodepressed but then today, I got some stuff, like real stuff, man. And I feel sssoo good. Wow, I hear birdies! ps. wow, that was a short buzz! 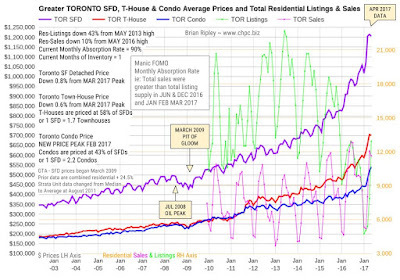 Just note that the recent rise in listings is the biggest zoom-up between dots on the whole chart. I would say then, that the listing panic has begun and next month's zoom-up will be big as well.